By translating theory and scholarship into concrete classroom practice in thoughtful and successful ways, Teaching Composition at the Two-Year College addresses the unique and specific needs of the two-year college teacher-scholar who teaches composition. 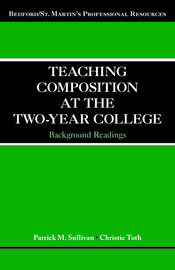 While providing an overview of the current state of scholarship related to teaching composition at the two-year college, it also emphasizes classroom-based concerns, with particular attention to the question most important to many teachers: "Scholarship and theory is all well and good, but what do I do in the classroom on Monday?" The collection includes classic or important theoretical essays in the field (many of them written by two-year college practitioners) followed by essays written by two-year college teacher-scholars that suggest how composition scholarship and theory might translate to the distinctive setting of the two-year college.